The Group has two articles posted earlier about Wing On Shing Shipyard (永安盛船廠) in Cheung Sha Wan – one about its activities during the Japanese occupation from the BAAG archive and the other about MV Tai Loy, the steel vessel it built after the War for the HK-Macau route. 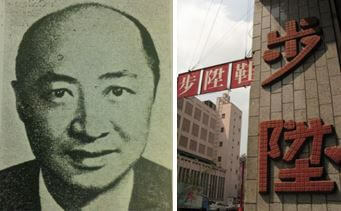 It turns out that the owner of the historic shipbuilding company – the Chan family – also founded the Po Shing Shoe Company (步陞鞋業, aka Posco), a leading local shoe manufacturer in the 1950s and 60s which still sells its shoes out of its ground floor store in its own building in nearby Sham Shui Po. From the 1930s through the 1980s, the two businesses prospered under the management of the four Chan brothers (in order of age): Chan Wing-kan (陳榮根), Chan Pui-kan (陳沛根), Chan Sik-kan (陳錫根) and Chan Tsan-kan (陳鎮根). Although in recent years the shipyard has faded into history and only the Posco store in SSP remains, several of the family’s descendants achieved success in different fields outside of the family business. Little information is available about the early years of Wing On Shing. According to an article about the shipyard in 1950, it was founded half a century before (1900) by two Chinese – one was a secretary with Kowloon Wharf and another was a carpenter with the Kowloon Dock. Presumably one of these two co-founders was the father of the four Chan brothers. The shipyard started out with a dozen workers in a small site of 2000 square feet in Cheung Sha Wan and focused mostly on repairing wooden vessels and tug boats for Kowloon Wharf. By the 1930s as the four brothers joined the family business, the yard began making its own tug boats achieving the record of building ten tugboats at the same time and also branched out into building of yachts with orders coming in from the US and the UK. The most prominent of the pre-war yachts built by Wing On Shing however was Madame Peace which took eight months to build in 1940 and was featured on the cover of the March 1947 issue of Yacht Magazine. [ii] During the Japanese occupation, Wing On Shing was occupied by the Japanese, details of which are covered in the BAAG article which I will not repeat here. After the War business boomed and Wing On Shing ventured into the manufacturing of larger vessels such as the 300 ton cargo ship Hudson which transported goods between Hong Kong and Macau and MV Tai Loy (renamed Chung Shan in 1968), the passenger vessel (allegedly the first steel vessel built after the War in HK) commissioned by Fu Tak-yum, the Macau casino mogul to transport HK gamblers to his gambling establishments in Macau. By 1950, the shipyard encompassed 111,000 square feet with its own lumber yard and 200 skilled workers (ramped up to 500 during peak times). The most famous of the Wing On Shing yachts built in the post war period however was Morasum thanks to a maritime incident involving the yacht which grabbed international headlines in 1969. The yacht was commissioned by Simeon Baldwin, a former Flying Tigers pilot during WWII whose Airstocks Ltd was the HK-based representative of Sikorsky helicopters, Pratt & Whitney jet engines and Bendix Aviation in the Far East and was launched on his birthday in 1958. [v] An avid sailor, Baldwin was sailing Morasum to Macau along with 2 yachts of fellow Royal HK Yacht Club members, Hector Ross (British colonial government official, son in law of Ford dealer Wallace Harper) and C. F. Von Sydow (Swedish merchant) in February 1969 when they encountered the People Liberation Army and all 3 yachts plus the 15 foreign nationals aboard were seized and detained in Guangdong. While 13 of the detained were released within 7 weeks, Baldwin was only released after 10 months of solitary confinement on the mainland. For six decades, the Wing On Shing shipyard was located on the waterfront of Cheung Sha Wan but as land supply became scarce in the 1950s, the government was keen on expanding the shoreline via reclamation. By 1957, reclamation work already restricted the shipyard’s business and in 1964, the shipyard was finally forced to relocate to Tsing Yi Island due to reclamation. After that the volume of production decreased and the firm was ultimately dissolved in 2013. According the FEER in 1955, the firm was listed as a maker of “boots, shoes, sandals and slippers of leather, cloth and embroidered plastic and canvas footwear” with HK$2 million in paid up capital. Its products were exported (especially to countries within the British Commonwealth where the firm enjoyed preferential tax treatment) and marketed locally through its stores and it also manufactured shoes and boots for security guards and factory workers. In addition to Chan Wing-kan and Tsan-kan, Lok Ping-cheong (駱秉昌 1902-1991) was also involved with the firm as a long-time director. Back in Hong Kong, Po Shing continued to grow in the 1960s with its own Posco building on Un Chau Street in Sham Shui Po and also a branch at 210 Prince Edward Road. In November 2011, the Prince Edward Road branch was closed as the site was acquired by the Urban Renewal Authority for redevelopment. As the eldest of the four siblings who built Wing On Shing and Po Shing, Chan Wing-kan (陳榮根, 1907-2000) served as the chairman of both companies. As a businessman, Wing-kan was relatively low key but as a philanthropist, he and his wife Au Big Yan (區碧茵, 1907-1992) were fairly high profile especially later in their lives. Au was a graduate of the Nankai Middle School in Tientsin and also studied in Japan. From 1983 to 1986, she served on the board of Po Leung Kuk, the last year as vice chairman. In 1988, she donated over HK$2 million to convert the former Western Fire Station building into the Po Leung Kuk Chan Au Big Yan Home for the Elderly. She and her husband were also devout Buddhists and she served as Executive Director of the Hong Kong Buddhist Association. Today the Buddhist Association has two schools which are named after them – the Buddhist Chan Wing Kan Memorial School and the Buddhist Wing Yan School (榮茵學校). The second brother Chan Pui-kan (陳沛根) was the lowest profile of the four. According to the BAAG report, he was the supervisor of Wing On Shing during the Japanese occupation. Chan Kwan-po, the pro-Beijing scholar and head of the Fung Ping Shan Library at HKU, listed an individual with the same name as his friend in his diary. Left: Chan Tsan-kan (Source: HK Album 1967) Right: Signs of the now closed Po Shing store on Prince Edward Road. The youngest of the four siblings – Chan Tsan-kan (陳鎮根) was born in 1916 and like his older brother Sik-kan was educated at the Government Vernacular Middle School (now Clementi Secondary School). He served as Managing Director of Po Shing Shoe for many years and in 1971, he led a 15 member delegation of HK footwear manufacturers to visit Japan on a study mission. A number of Chan family descendants achieved success outside of the family businesses. Peter Chan (陳汝仁) who joined the government’s Marine department as a surveyor of ships in 1962 and rose to become the first Chinese to head the department in 1984 before transferring to the UK in 1986. [ix] One of the Chan daughters was a headmistress and two of her children are well known in two vastly different fields – Tom Lau Ko-yuen (劉高原) as chairman of PYI (which owns Paul Y Engineering) is a major player in the construction and ports development while his younger sister Lau Ko-chung (劉高琮), better known by her stagename Suzie Wong (蘇施黃), is a popular radio DJ and host of TV cooking programme. [ii] Kung Sheung Evening News 1950-8-4. This article was first posted on 31st October 2016. York, very interesting articles on Po Shing and Wing On Shing, especially when the reader is one of the grandsons of the Chan sibling who wasn’t mentioned. You are not to blame for the omission, as my maternal grand father wouldn’t have the decades of management and directorship under his belt like his other siblings; he and his wife sadly passed away in their early 30s and late 20s, respectively, during the war. One minor thing that I wish to bring to your attention is that Mr Chan Wing Kan passed away in 2001, not 2000. Are you a family friend? Distant relative? Thank you for educating myself about something about my family! Thanks Brian for the correction. What was the name of your maternal grandfather? (I presume it ends with character Kan 根?) I am not a family friend or relative. His name is 澤根, and I believe “chak” would be a reasonably close transliteration.